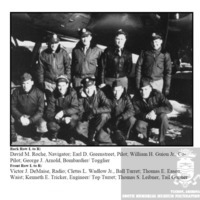 The 390th Bomb Group's 569th Bomb Squadron crew, which operated a Boeing B-17 Flying Fortress during World War II. The squadron was activated in early 1943 and was deployed to Framlingham, England, to serve in the European Theater of Operations (ETO) in July of 1943. Assigned to the VIII Bomber Command, this strategic bombardment squadron consisted of, photographed from left to right in the back row, navigator David M. Roche, pilot Earl D. Greenstreet, co-pilot William H. Guion, Jr., and bombardier/togglier George J. Arnold, as well as, from left to right in the front row, radio monitor Victor J. DeMaise, ball turret gunner Cletus L. Wadlow, Jr., waist gunner Thomas E. Eason, engineer/top turret gunner Kenneth E. Tricker, and tail gunner Thomas S. Leibner. One notable member of the crew was Florida native Staff Sergeant Thomas E. Eason (1922-1945), who served for over three years in the U.S. Army Air Forces' (USAAF) as a waist gunner on a Boeing B-17 Flying Fortress nicknamed "Sweet and Lovely" and "Princess Pat." SSgt. Eason completed 28 missions in both the Pacific and European Theaters of World War II. On January 20, 1945, he was killed near Altenheim, France, after his airplane was shot down by enemy combatants. Over the course of his service, SSgt. was awarded the Distinguished Flying Cross with two Oak Leaf Clusters. Digital reproduction of original tab=operationalrecords">black and white photograph. Copyright to this resource is held by Richard E. Drain and is provided here by RICHES of Central Florida for educational purposes only. "569th Bomb Squadron." American Air Museum in Britain. http://www.americanairmuseum.com/unit/1251. 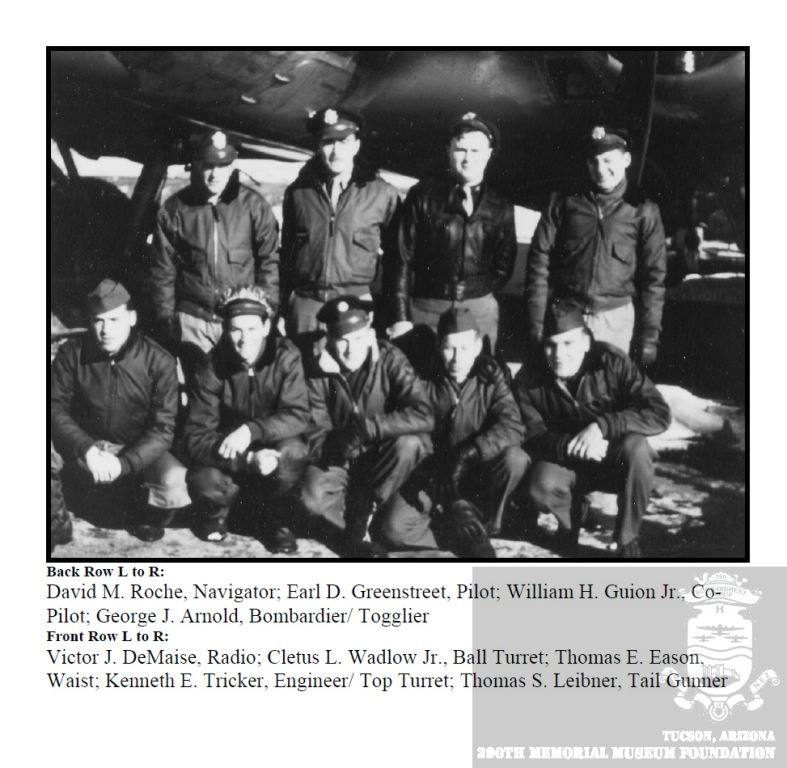 “390th Bomb Group's 569th Bomb Squadron Crew.” RICHES of Central Florida accessed April 22, 2019, https://richesmi.cah.ucf.edu/omeka/items/show/9305.